Edward Albee knows how to observe people of a certain class. In “A Delicate Balance” he puts a seemingly perfect family under the microscope. Outwardly, Tobias and Agnes have it made. They are charming, educated, elegant and privileged, and appear to love one another. Tobias is unflappable. Agnes speaks with the polished diction of a college professor. Their bar is well stocked, their tasteful library is beautifully bound in custom leather, their furniture is stylish and their servants efficient. So why, as they enjoy a cocktail before dinner, does Agnes begin the conversation by wondering, in carefully measured, witty, articulate sentences, whether she will one day go mad? It would seem that their apparent perfection is indeed, “A Delicate Balance” which might, at any moment, tip into madness. The perilous tipping points become more and more evident throughout the evening. Agnes’s sister, and permanent houseguest, Claire, is an out-of-control alcoholic. Daughter Jessica is returning home from her fourth failed marriage, and Tobias, ever easygoing and nonchalant, avoids talking about this or any other problem. He does, however, as he continually boasts, make an absolutely perfect martini. Linden Young as Agnes, Rachel Klyce as Claire and Christian Phillips as Tobias in Actors Theatre of San Francisco’s production of Edward Albee’s “A Delicate Balance”. Photo credit: Actors Theatre of SF. The balance is further threatened by the unexpected arrival of neighbors and best friends, Harry and Edna, who inexplicably move in as uninvited houseguests, declaring that they were suddenly overwhelmed by an unnamed fear and didn’t know where else to go. Whatever delicate balance kept them from the abyss has vanished and they now threaten to pull Agnes and Tobias along with them into the void. As always with Albee, the material is dense and challenging and disturbing, and presented with a mordant wit that provokes continuous laughter. Albee is the great American master of black comedy, and “A Delicate Balance” is Albee at his best. Although it includes many moments of excellent acting, this production is hampered by a failure to fully establish the perfection of balance that exists before the collapse. For this play to be fully successful, the polished surface presented by Agnes and Tobias must be flawless. The cracks should not be visible at all, and the balance must tip very, very subtly and slowly. If everybody’s surface manners (with the exception of the alcoholic Claire, the only identified “problem” in this family) are not impeccable, the play suffers. Director Keith Phillips and his actors, alas, have not fully succeeded on this crucial point. On the other hand, Christian Phillips does some excellent work as Tobias, starting out with a preternatural calm and gradually losing his grip as he begins to feel the rise of his inner panic. As the rigidly controlling Agnes, Linden Young does some fine work in the third act as she tries to keep the pieces together when they are clearly falling apart. Jessica Riso is attractive, but unnecessarily strident as their relationship challenged daughter, and Rachel Klyce is fine as the alcoholic Claire. Randy Hurst and Jessica Riso (especially the latter) do a good job of conveying the desperation felt by neighbors Harry and Edna. 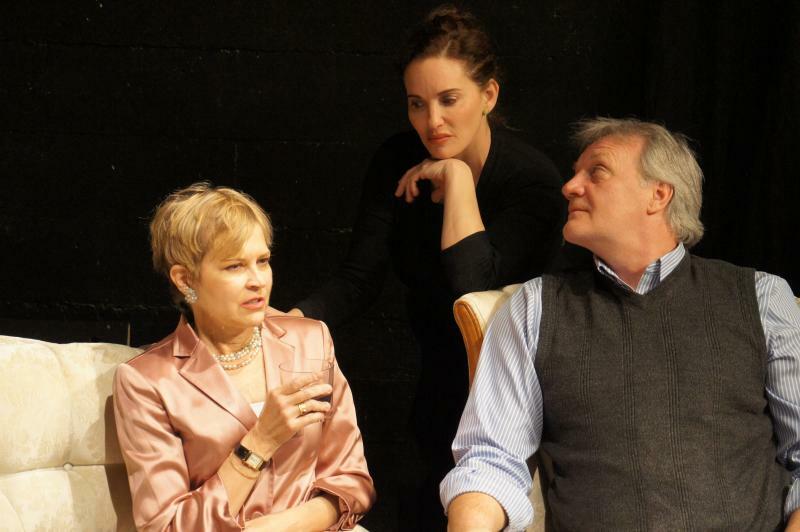 “A Delicate Balance” by Edward Albee, directed by Keith Phillips, produced by Actors Theatre of San Francisco. Co-Directors: John Krause, Carole Robinson. Technical Director: Biz Duncan. Set Design: Biz Duncan. Light Design: Rachel Klyce and Biz Duncan. Costume Coordinator: Carole Robinson. Agnes: Linden Young. Tobias: Christian Phillips. Claire: Rachel Klyce. Edna: Delinda Dane. Harry: Randy Hurst. Julia: Jessica Risco. Posted in Reviews.Tagged A Delicate Balance, Actors' Theatre of San Francisco, Edward Albee, Keith Phillips.